DxO isn’t just a tool for correcting lens aberrations. It’s also a very powerful and effective RAW conversion program, and while it might not offer the localised adjustments of Aperture, Lightroom or Capture One Pro, it does have some very precise tonal and colour controls – like the DxO Multi-Point Color Balance tool. I must admit I’ve steered clear of this in the past because it looked complicated. I assumed it was something to do with white balance, like the multi-point white balance adjustments you get in some programs and cameras, and I found DxO’s regular white balance tools fine for what I needed. In fact, it’s something different. 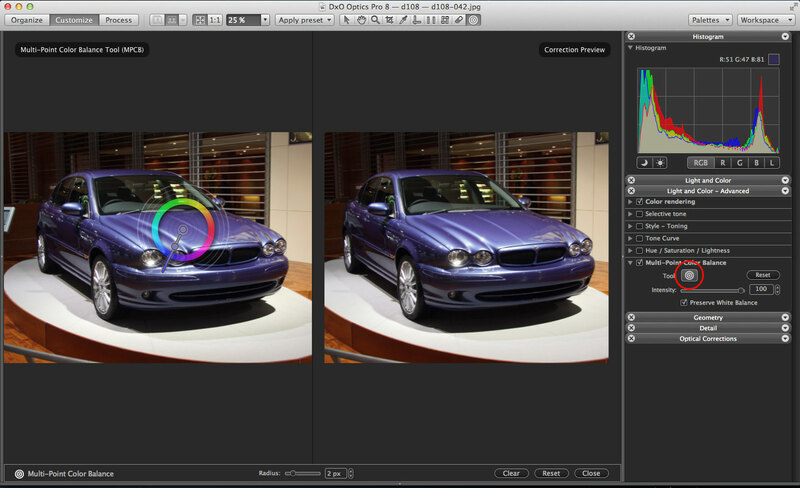 The Multi-Point Color Balance tool is for adjusting specific colours without affecting the rest of the image. It does the same job as the editable colour ranges in Photoshop’s Hue/Saturation dialog and the Hue Saturation Lightness adjusters in Aperture and Lightroom. You target the colour you want to modify and then change its properties. 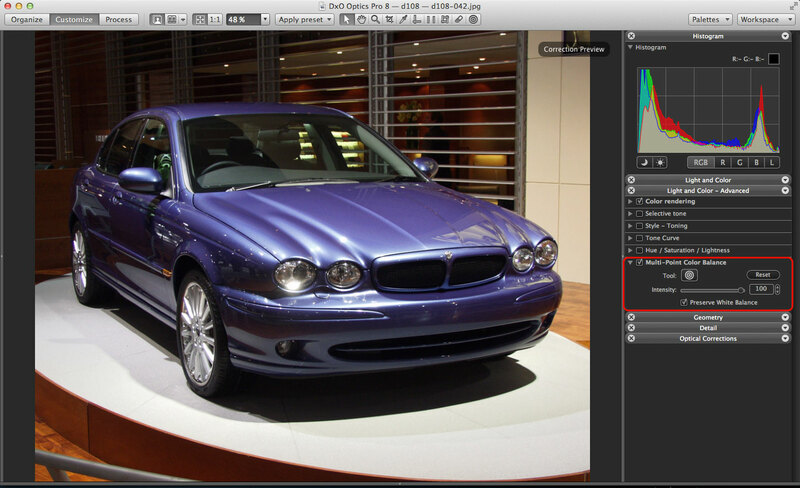 I can show how this works with this photograph of a Jaguar saloon I took at a motor show. 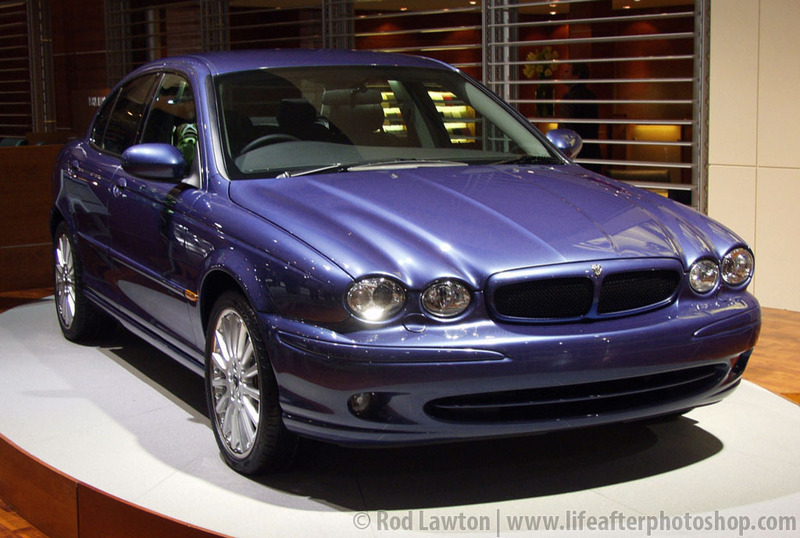 I want to see if I can change the car’s lilac colour to blue without changing the colours in the rest of the picture. You’ll find the Multi-Point Color Balance panel in the Light and Color – Advanced tab in the tools panel in the right sidebar in the Customize mode. If you don’t see it, you may be using the DxO First Steps workspace, so use the Workspace button at the top right of the program window to swap to DxO Advanced User. If you click the checkbox right next to the panel heading, the Multi-Point Color Balance tool is enabled. When you click on this tool, the screen splits in two. On the left is your ‘before’ image, and this is where you place and adjust the tool, and on the right is the ‘after’ image which shows what the picture will look like with your adjustments applied. If I click on the bonnet of the car, this rather complex-looking hue wheel appears, with a single control bar pointing outwards from the centre. By manipulating this control bar, you can change the target colour under the tool. Thanks for pointing this out. This is a good tool to have and built into DXO. I did not notice it is in DXO until I read it here. I have another simple plugin for PS 32bits and that is color mechanic. They do not upgrade that tool any more but inside PS, it allows you to change the one or many color to other color and brightness as well. Next Next post: Have you ever tried HDR Efex Pro portraits?